نصيحة حول الغرف: افضل الغرف المطلة على البرجين ..
Warmest greetings from Traders Hotel Kuala Lumpur. Thank you for sharing your kind comments with us on TripAdvisor. We are delighted to hear you enjoyed staying with us. Traders Hotel offers an unobstructed full frontal view of the Petronas Twin Towers, which is stunning especially during sun set hour! It was a pleasure having you and we hope to welcome you again in the future. Warmest greetings from Traders Hotel Kuala Lumpur. Thank you for sharing your kind comments with us on TripAdvisor. We are delighted to hear you enjoyed your stay with us. It is our duty to provide you with the highest service throughout your stay. It was a pleasure having you and we hope to welcome you again in the future. فندق رائع .. التصميم انيق وعصري .. النظافه عاليه وبشكل يومي .. الموقع الى حد ما جميل قريب من البرجين وشارع العرب هناك عربات غولف لنقل من الفندق للبرجين والعكس .. يوجد ماهو افضل من موقعه بالقرب من البرجين .. اطلالته رائعه على قراند البرجين .. الغرف واسعه وانيقه والسرير مريح .. الفطور متنوع الى حد ما يخلوا من بعض الاصناف المناسبه للعرب .. كانت اقامه مميزة .. الجم رائع وذو اطلاله خلابه ..
Warmest greeting and we had a great pleasure to have you here too! The team and I are delighted to receive your kind compliments which you have shared from Trip Advisor and glad that you were well taken care by the team. The service team puts in their best efforts to ensure that all our guests are happy during their stay. Thank you for sharing your feedback with us. 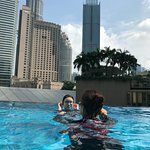 We are glad that you had a great time while in Kuala Lumpur. 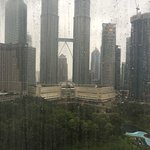 Perhaps, during your next stay, you can choose to stay at Traders Hotel Kuala Lumpur, where we offer one of the best views of the Petronas Twin Towers from your room, with a central location for your convenience. Thank you for staying at Traders Hotel Kuala Lumpur. We are pleased to hear that you had a great experience from your feedback shared and look forawrd to welcoming you back to the heart of hospitality. Thank you for highly recommending fellow travellers to stay at Traders Hotel Kuala Lumpur! My team and I are appreciative of your glowing review and it has been a pleasure looking after you during your stay with us. We look forward to welcoming you back soon.